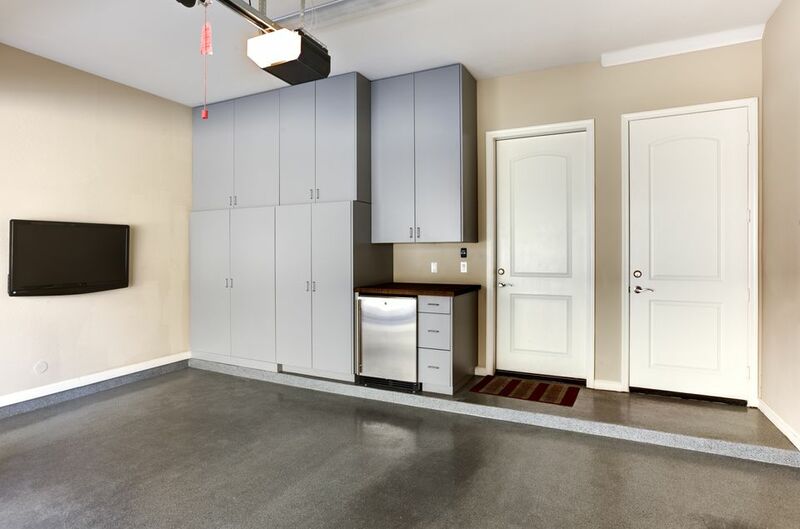 Cabinets are certainly not required in the garage. Open shelving is less expensive, extremely strong, easy to install and reconfigure, and it also keeps stored items visible. But cabinets do offer a more finished look, and being able to store potentially dangerous items behind closed and locked doors is a safety feature appreciated by parents of young children. If you’ve never looked into garage cabinets before, you might be surprised at the range of products available. Here are the major categories available to do-it-yourselfers. Standard kitchen cabinets are not going to be as rugged as cabinets built specifically for garage use. But used kitchen cabinets can be easy to find, given the popularity of kitchen remodeling, at very attractive prices. If you want to install some cabinets in your garage, then scout around for some used kitchen units. Check local classified ads, or seek some advice from a remodeling contractor. If you are planning a kitchen remodel yourself, think about putting the old cabinets to use in the garage. Ugly kitchen cabinets can be improved significantly with a coat of paint and some new hardware. If you are looking for new cabinets built specifically for the garage, plastic units will usually be the most affordable. They are also easy to find and to clean, waterproof, and rust proof. Most plastic cabinets are assembled easily by snapping the parts together. You can find units with lockable doors and adjustable shelves that can be wall mounted or set on the floor. Plastic garage cabinets are available at home centers and big-box retail stores. You can also buy cabinets that fit into slot-wall systems. Several manufacturers offer sturdy cabinets for the garage that have plywood, medium-density fiberboard (MDF) or particleboard cores covered with durable melamine or similar plastic laminate surfaces. The biggest selection will be found online, where you can find a wide selection of styles, sizes, and colors. Some assembly will be required.